Four years ago, Razack Lokina, Research Fellow and Director of EfD Tanzania, took the initiative to establish a research policy board for his EfD Center. The aim was to facilitate transfer of research findings to decision makers and other stakeholders, as well as to bring in ideas about what types of research are actually needed by society. One of the direct results of the establishment of the board is the EfD participation in the review of Tanzania´s National Strategy for Growth and Reduction of Poverty (2005-2010) commonly abbreviated as MKUKUTA in Kiswahili. The ideas to further enhance research policy dialogue are abundant. A stronger emphasis on sustainable growth, interventions to address climate change, and better management of natural resources for poverty reduction are some important outcomes of the EfD review of the second Tanzania´s forward-looking National Strategy for Growth and Reduction of Poverty for 2011-2015, or MKUKUTA II (2011-2015). “The task of reviewing the MKUKUTA is a result of our collaboration,” says Arnold Mapinduzi, Senior Environment Management Officer at Tanzania´s National Environment Management Council (NEMC) and original member of the EfD Tanzania Policy Board. Another outcome of the board´s dialogue is that Dr. Julius K. Ningu, Director of the Environment Division at the Vice-President’s Office, held the opening speech (Greening the Economy Through Better Management of Wildlife and Forestry) of the EfD Policy Day 2011 in Arusha, Tanzania, which also started that year´s Annual Meeting. “Whether in Tanzania or other countries, the EfD initiative is a very important program because it’s bringing the essence of environmental economics, the valuing of environment and natural resources, into decision making and development processes,” says Mapinduzi. Mapinduzi has plenty of ideas for better knowledge transfer. One is that EfD researchers could teach staff from NEMC and other ministries the basics of environmental economics, just to give them a rough idea about for instance environmental valuation, accounting and integrated ecosystems assessment. The EfD Tanzania Policy Board could also organize policy brief sessions for different stakeholders that include policy makers, and sessions to present findings to news media. Like the board collaboration, policy meetings can affect the research agenda so that EfD research is carried out in certain valuable areas at the policy and household levels, he says. “And through a media session, where you package your presentation in simple ways towards policy makers, you can reach the general public and decision makers. Whether or not I end up reading a report or academic paper often depends on whether I find it in the news media,” says Mapinduzi. During the Policy Day 2011, members of the policy board also took the opportunity to challenge EfD researchers. Several news media reported from the day and for example The Guardian reported under the heading Researchers challenged to reach out to ordinary people. Left: Razack Lokina, Research Fellow and Director of EfD Tanzania, took the initiative to establish a research policy board for his EfD Center. 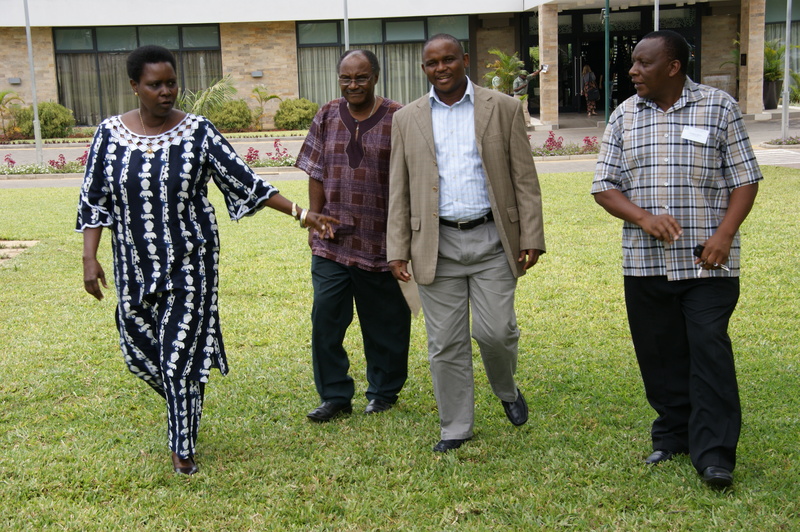 Upper left picture: From left Blandina Cheche, Poverty Environment Coordinator, Vice-President’s Office, Claude Mung’ongo, Professor at the University of Dar es Salaam’s Institute of Resource Assessment, Arnold Mapinduzi, Senior Environmental management officer, The National Environment Management Council (NEMC), and Salvatory Macha, EfD Project Administrator.